Whether you’re taking pictures of your kid at his first soccer game or hoping to capture the majestic movement of birds to the south in time for winter, it’s always better to be up close to your subject. The bitter truth photographers must face though is that finding the perfect vantage point isn’t always as easy as we’d prefer it to be. More often than not, the distance between photographer and his subject can significantly sap image quality and detail. Fortunately, modern cameras have been designed with superior zooming capabilities to help bridge the gap and bring the photographer closer to his subject – without the need to take a single step. If you’re in the market for the best zoom camera, then you’re in luck. We’ve rounded up the five best zoom cameras on the market to help you find the right one for you. Nikon is one of the photography brand juggernauts taking the market by storm. This 100 year old Japanese brand takes pride in its extensive line-up of state-of-the-art imaging equipment and devices that put it at the front lines of the photography industry. All that said, it’s no surprise that the top camera on our list of the best zoom cameras comes from this coveted brand. The Nikon COOLPIX P900 Digital Camera with 83x Optical Zoom and Built-in WiFi is one of the most sophisticated pieces of photography equipment available. It boasts an 83x optical zoom capable of bringing photographers closer to their subject without having to move from their spot. This powerful zoom camera is often used by professional photographers who want to be able to zero in on targets without trouble. On top of its superior zoom feature, it also comes equipped with a 16MP CMOS sensor for crystal clear detail, full manual exposure, a vari-angle display, and a high resolution view finder. Packed with so many top-notch features, the COOLPIX P900 is definitely a great choice for buyers who are looking for the best zoom camera on the market. Superior 83x optical zoom closes the gap between photographer and subject without losing detail. Built-in WiFi connectivity for easy image management and wireless transfer. Vari-angle display lets users see their LCD display from any vantage point. High resolution view finder for users who want to see their subject through the lens. Full manual exposure gives users greater control over their captures. A little on the pricier side, but definitely offers greater performance than any other option available. Another great brand if you’re looking for the best zoom cameras is Canon. Also hailing from Japan, this imaging brand has been around for 79 years, and offers an extensive array of different cameras that cater to beginners, amateurs, and seasoned professionals. Their entry for our list of the best zoom cameras is the Canon Powershot SX60 Digital Camera with 65x Optical Zoom. With a 16.1 megapixel high-sensitivity CMOS sensor, this camera can easily preserve detail in clear perfection – no matter how close you zoom in. The device also boasts a powerful optical image stabilizer which promises to keep your camera’s view steady even from great distances. This minimizes noise and distortion that could develop around the edges of pictures as a result of a shaky hand. Not to be outdone by its Nikon counterparts, the Canon Powershot SX60 Digital Camera also features Wi-Fi connectivity for seamless image sharing and storage. Finally, it comes equipped with a bright, vari-angle LCD screen that accurately represents captured images for greater user control. All in all, the Canon Powershot SX60 Digital Camera is a close contender for first place. When it all comes down to it, the only real question is whether or not you’re a big enough fan of the brand to choose it over Nikon. 65x optical zoom for perfectly zoomed in images no matter the distance between photographer and subject. Optical image stabilizer makes sure distortion and noise are kept at minimum. 16.1 megapixel high sensitivity CMOS sensor maintains images crisp and clear in all situations. Vari-angle display lets users hold their cameras at whatever distance from their body without losing sight of their display. Wi-Fi connectivity makes it easy to share and store pictures wirelessly. Not exactly the cheapest option on the market. When we think of pictures, one of the first brands that come to mind is Kodak. Back in the day, Kodak was the number one option for consumers who wanted affordable and high quality prints. But now that photography has become more digital, Kodak has lost a large part of its market. Despite this, Kodak still enjoys a positive reputation among its patrons. To combat its competition, the brand has also released numerous cameras and other imaging devices into the market. So far, their best zoom camera is the Kodak PIXPRO Astro Zoom AZ421 Digital Camera with 42x Optical Zoom. When it comes to functionality, of course, the Kodak brand doesn’t quite compare with Canon or Nikon. But the brand is making some effort to please the discriminating consumer population. The PIXPRO Astro Zoom AZ421 claps back at competitors with an industry-standard 16.1 megapixel CMOS sensor for crisp, clear detail. This camera also boasts a face beautifier mode which makes it an ideal choice for the selfie-population. It can also detect dog and cat faces to enhance lighting and give you better results when you take pictures of your beloved pets. Now, if you’re still not convinced, here’s the best part. The PIXPRO Astro Zoom AZ421 Digital Camera comes at just a fraction the cost of other cameras on the market. Now if you’re working on a budget, this one can be a very smart pick. Highly affordable. Much, much cheaper than any other zoom camera on our list. 16.1 megapixel CMOS sensor is an industry-standard that competes with other cameras on the market. Face beautification and face, dog, and cat recognition guarantee beautiful pictures of these specific subjects with each snap. Stylish body makes it a great accessory for carrying around for fashion and travel purposes. 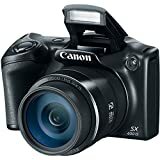 Yet another great release from the Canon brand is the Canon SX530-CR Powershot Camera with 50x Optical Zoom. This powerful camera incorporates all of the same industry standard features as other Canon cameras on the market, and boasts the same high quality features as the previously discussed camera from the same brand. Equipped with a 16.0 megapixel CMOS sensor, optical image stabilization, built-in WiFi connectivity, 1080p full HD video capture, and a large 3.0 inch LCD viewing screen, there’s not much else you would want from a zoom camera. What’s more, it’s significantly cheaper than other options on the list. At just half the price of the SX60, this one is definitely a good choice if you don’t have a lot to splurge. The only real issue is that the camera is an older model, which means you may have a hard time finding accessories and extra attachments for it. Otherwise, it’s a perfectly problem-free choice. One of the best zoom cameras on the market, with superior quality images and minimal noise and distortion. Powerful 50x optical zoom perfect for taking images from vast distances. Built in Wi-Fi connectivity makes it much easier to transfer files to and from your camera. Large display offers better resolution compared to other cameras on the market. On the cheaper side of the price spectrum. Might be difficult to find accessories and spare parts. Of course, when it comes to consumer electronics, there are few brands that are as popular as Sony. This household name boasts a wide variety of different electronics that are guaranteed to satisfy even the most discriminating of consumers. Now with the high demand of high quality imaging devices, Sony has also come out with various cameras that have made a mark in the industry. 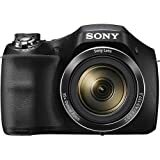 The Sony DSC-H300/BM Point and Shoot Camera with 35x Optical Zoom is one of the best zoom cameras on the market. This powerful device features a 35x optical zoom function, which despite being marginally lower than other cameras, still offers great versatility out on the field. The camera comes equipped with a 20.1 megapixel high sensitivity CMOS sensor that leaves competitors in the dust. It also features an Optical Steadyshot function that keeps the lens locked on its subject regardless of shaky hands. While it is much cheaper than other cameras on our list, the Sony DSC-H300/BM does have some downsides. That is that the camera doesn’t support Wi-Fi connectivity. Compared to other cameras in the same segment, Wi-Fi is something of an industry standard, and not having the feature means a tedious wired image transfer process. Proves to be an affordable option, perfect for buyers who are working on a budget. 20.1 megapixel CMOS sensor is highly sensitive, leaving images free of noise and distortion no matter the distance. Optical steadyshot guarantees crisp detail despite shaky hands and movement. 35x optical zoom isn’t as powerful as the others, but still proves to be a very versatile tool. Not Wi-Fi capable, making file transfers tedious and time consuming. There are lots of different zoom cameras on the market, and each one brings something unique to the table. While that helps guarantee that everyone will find a good fit for their needs and preferences, it also means that finding the best zoom camera for yourself could be a bit of a challenge. Instead of sifting through all your options without a clue which camera will suit you best, be sure to keep these considerations in mind to help you land the best zoom camera on your first try. Optical Zoom Capacity – The optical zoom capacity of your chosen camera ultimately tells you how well the device can magnify your subject. An optical zoom of 85x means you can zoom in up to 85 times to close in on your target. If you expect to take a lot of distant photographs, a bigger optical zoom capacity should work in your favor. But if you just want the high zoom capacity in your arsenal in case you need it, a lower reading like 35x or 50x might suffice. Digital Zoom – Don’t be confused with optical and digital zoom. The two are very different. Optical zoom means your lenses actually move in order to magnify your subject. Digital zoom simply means that the captured image is zoomed in by closing up on a specific area of the picture and cropping out the excess borders. A large digital zoom capacity doesn’t necessarily mean you can zoom in close during your photo taking, so be careful not to get confused. Accessories – You can improve the zoom on your camera by buying new accessories to fit it. New lenses can further increase the optical zoom capacity of your chosen camera, so make sure to choose a device that has available lens attachments on the market. It’s true – choosing the best zoom camera can be a challenge, especially with so many different options available. Don’t make the mistake of buying a device that won’t suit your needs or preferences. Avoid the expensive episode of trial and error and save yourself from wasted spending by checking out our top 5 zoom cameras to narrow down your options and ease your search!